Tickets are $10/$15 at the door. 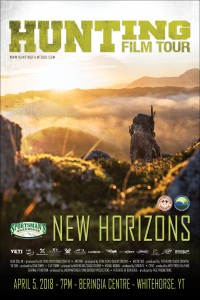 Join us at the Hunting Film Tour Premier in Whitehorse, YT! The show is held at the Yukon Beringia Interpretive Centre. Tickets will be available at the Yukon Fish and Game Office and Hougen’s SportsLodge for $10 or at the door for $15. All proceeds will support the local conservation efforts of the YFGA! There will be a ton of cool giveaways and draws so be sure to enter your name on the sweepstakes cards for you chance to win!